We are proud to announce the launch of Tino’s Southwest Kitchen website. Tino’s Southwest Kitchen is a family-friendly Fort Myers restaurant serving homemade favorites from classic taco plates to chimichangas and more! 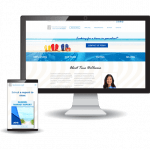 Visitors to their single-page website are greeted by a vibrant color palette and a custom-animated logo designed in-house, encouraging them to engage further with the website. Continuing down the page, the website has an easy-to-navigate menu and user interface for potential customers. The website also features a user-friendly content management system that allows the restaurant to edit their online menu with ease.